Apple has recently seeded the sixth beta of OS X 10.11 El Capitan to developers for testing. The release took place just a week after the release of the previous beta and about two months after the official announcement of El Capitan at Apple’s Worldwide Developers Conference. The latest version of OS X 10.11 has a build number 15A244d. The guys from Cupertino haven’t added any new features to this update, moreover, they haven’t changed the design of the operating system. OS X 10.11 El Capitan is only under-the-hood update that can boast of only stability, security and performance improvements as well some bug fixes. This is a pre-release update to OS X v10.11. If you have OS X v10.11 installed, download this update by clicking Updates in the toolbar of the Mac App Store. If you do not have OS X 10.11 installed, use your download code on the Mac App Store to get started. 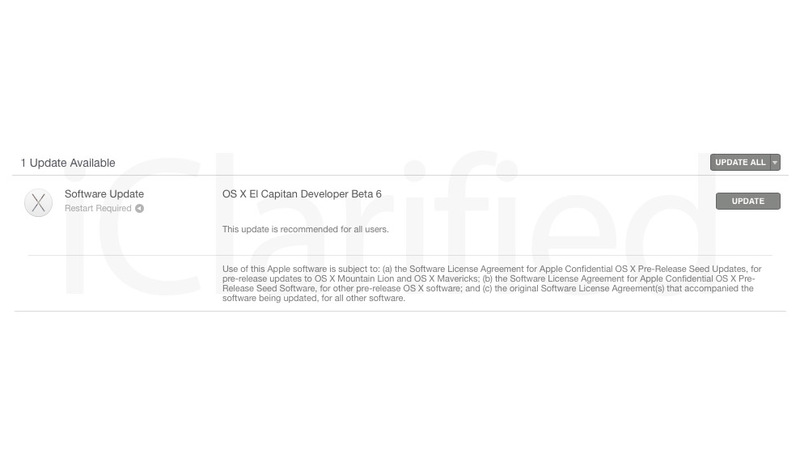 If you have a developer account, you can download the latest OS X El Capitan beta right now. It is available via Apple’s dev portal or using the Software Update option of the Mac App Store. Keep in mind this pre-release version may be quite unstable. Don’t install it on your main computer. Apple will release OS X 10.11 El Capitan to public this fall, that’s why I recommend you to wait.